Keep asking. What will you hear? I can’t say. When we talk about hearing God and what He says your true name is what we mean is simply, you will just be hearing what the Creator has to say about you. It may be a name. For Craig, it was hearing “you are a McConnell” (his biological father’s name). Or it may be quite descriptive. For me it isn’t a name like “Robert” or “Maximus” rather it was a description of flowing words of description that also tied into His plan for my life. For Mason Stewart, he heard “Your name is Mason. You are a builder”. So it was his own name but a twist on his name that God used to direct Mason to the potential God saw in him. So I can’t tell you what you will hear. All I can do is implore you simply start asking. Start the conversational intimacy with the Father and let Him speak to you. Get that? “Let” Him. Do the work on your part to get away, get silent and still. “Be still and know I am God.” Do your part to clear the deck mentally and spiritually and ask the Father to speak. Next week is our last week of the Spring ManSchool. We’ll take 4-5 weeks off and then start back with a Summer ManSchool Lite so that we can keep the continuity of gathering our Tribe together until we come back next Fall to finish Wild at Heart, tackle warfare, adventure and Eve. This week, we wrapped up Craig’s powerful talk about our new name, the name God has for us. Next week, I will share with you how I heard my name and what it has meant to me as a man. I hope others of you will have a similar story to share. Between now and next week, I want to ask you to commit to getting alone with God, clearing the decks and inviting God to speak to you. Forget what your Dad said about you, your brother, your Mom, your coach, teacher or boss. No, instead, clear the decks and invite your Creator to speak into your heart what He has to say about you. Let’s get quiet. What does this clip stir? What’s God saying right now? So that, I can leave the wound, the vows, the messages and the scripts given to me and I can now be a new man. Have my identity restored, my masculinity restored and reach a turning point in my relationship with you? Could it be true that I can regain everything? All that has been lost, stolen, given away? The answer is yes. It’s true. When you hear that from God himself, it’s a whole new ball game. God, speak to me. How do you see me? Speak deep. Speak profound, true words of a Father to a son. Clear the decks. Speak something powerful, more powerful than I’ve ever heard. Ask God. There’s a remarkable turning point in your life when you hear from God who He says you are. Take back your true identity. This may not be a “one and done” thing. You may need many “deck clearing” times in order to truly connect to the Father and let him speak. Mine was in a prayer session at a Ransomed Heart boot camp. The room was dimly lit, hundreds of men were deep in prayer and Craig or John one was calmly praying like above just inviting Jesus in, asking Him to speak and I just started writing…furiously. As the words came – not words I orchestrated – just clear words flowing through my soul to my hand almost as if I had no control over the hand. The words just came and God spoke. And I heard my name. You may hear him by your favorite stream or on a hillside overlooking the River. You may hear watching the sun set night after night. Calm, still, quiet asking the Father “Lord speak. What do you say about me”. There is no telling where you may hear God or what it is He has to share. But you probably will never know, unless you ask. Men, do this. Take the time this week and do it. I pray the Lord comes and speaks. If you don’t hear Him, don’t be distressed. There is nothing wrong with you, its just not time. Keep asking, keep after it, keep seeking Him. I am confident if you do, you’ll know. Please join us to tomorrow as we complete Craig’s powerful talk about hearing what God has to say about you. Last week’s was powerful and this will be a fantastic conclusion that I think will bless you. Next week will be our wrap up for the Spring. We’ll draw it all together, give you some thoughts for the summer and just enjoy what God has done in our midst. Jesus comes at times and surfaces things and says, “I want to deal with that”. He does so because He has a mission. He seeks to liberate that which we’ve buried in our shame, guilt, fear and woundedness. Craig was sitting overlooking the beach having his quiet time and a young lab pup runs up to him. Excited and eager … “hey you wanna go play? You wanna chase me? I’ll chase you! Come on, let’s play”. Craig shoed the dog away so he could go back to the Lord. 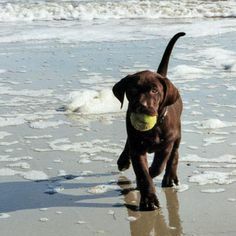 A little while later, he sees the lab down on the water’s edge chasing birds, running, playing … just being a lab. The lab shows up at the beach and he just wants to be all that God made him to be. Living. Free. No boundaries. He can’t read the signs that say “no dogs on the beach”. He has no restraints. He’s being exactly who God wants him to be. And after shoeing him away, he found himself saying “I want to be a lab”. Don’t we all? The vows sort of become a script for my life, my identity. “I’m a seagull”. I became that. I had nothing to offer, nothing to say, only taking up space. The wounds took deep root. Shame and contempt. “I’ll never be a man that makes a difference or says anything that changes or encourages anyone”. Ephesians 1 – He had me individually in mind before the foundation of the earth with plans to adopt me and celebrate by lavish gift giving. Uniquely crafted and created. Psalm 139 – knitted together, fearfully and wonderfully made. He had something in mind when He created me. It is much like a coach or a CEO pulling you aside after tons of hard work, pushing yourself, not sure anyone is noticing and he says “I see what you’re doing and I just want you to know I have big plans for you”. Imagine that. Imagine what that would stir in your soul. Now imagine the 1000x impact of God saying that you! Revelation 2:17 – for those who overcome, I will give him a white stone with a new name written on it known only to the one who receives it and to God. A descriptive name of who He intended me to be. We have that! All of us. A True name. A unique name. A God name. No, what seems quite easy to remember and what seems to govern our lives is what others think we are. We know what our brother said about us and to us. We know the words Mom spoke over us or Dad labeled us with. We can recite them from memory. We can even remember where/when it happened. And yet, most of us have forgotten who God called us to be. God gives us hints of this throughout our Christian life. Wouldn’t you like to know? Once you know all of this is true and once all this becomes real that you are a son, adopted and loved, once that captures you…wow. Do you want to know who you are? Ask God. Take all you read about who God says you are, pound on the door and all out “LORD, imbed this in me, in my being. Remove everything contra and counter that shouts down truth”. If you really heard what God has to say about you and your life, you’d be embarrassed to share it or you’d think you were making it up because what God dreams about you is far greater than you could imagine. It’s the thing you most want to be but can’t imagine being. Would you believe it? Would you jump into it? We’ll have more to share on this morning’s session but in the interim, we have some homework for you. What does God have to say about you? Open the Word and find 1-2 verses that speak to this i.e. “knitted together in your mother’s womb” or “you are fearfully and wonderfully made”. Some of you will know immediately of special, reassuring verses to you of how God shines His favor upon us. Share them. I will compile back a list of these and share them with the group at large. Trust me in this…if you will dig and search, it will bless you and it will bless others. Tomorrow morning – what does God have to say about you? tomorrow morning, we move out of the wound and the agreements we make with those wounds and we start to look at what God has to say about us. You don’t want to miss this. These past 6-8 weeks have been deep, painful, slow, tedious and revealing. Tomorrow we take the next step towards freedom.